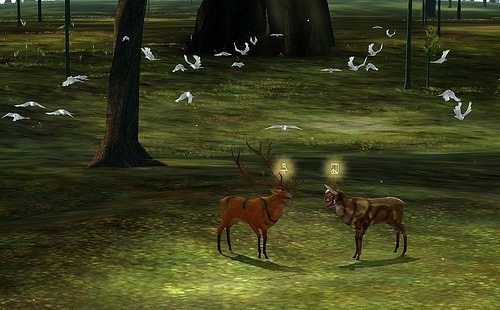 In The Endless Forest players can explore a beautiful and peaceful game world as a deer. The game is free to play and a massively multiplayer online experience meaning you’ll run into plenty of other players during your adventure. In the game players don’t have any goals or even the ability to talk to other players, the game is all about simulating what life would be like living as a deer in a peaceful environment. The Endless Forest is definitely in a genre of its own with this very interesting and intriguing approach to gameplay. After registering an account and downloading the game software players will be able to enter the game world as a simple fawn and over time (based on real time) will be able to mature into a larger deer. Much of the gameplay centres around exploring the game world with only a few activities available including swimming, dancing and playing tag with other deer that they encounter. While the game doesn’t support speech or text players are able to communicate through the Forest Action system which lets players complete basic actions to communicate a point. 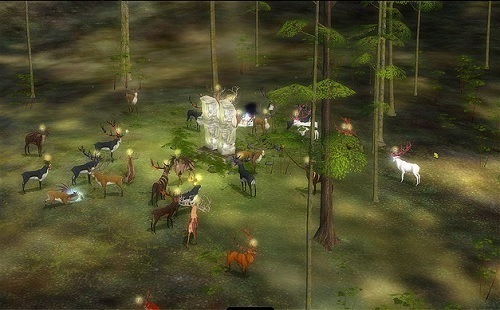 The game also uses a Forest Magic system which lets players change the appearance of deer around them as well as a limited number of options to alter their own appearance. Most of these customisations change a players antlers and aren’t permanent on fawn, eventually wearing off or wiped clean by a swim in the pond. If you want something that promises a very different MMO experience or want a game that lets you play as an animal then The Endless Forest will be a very enjoyable adventure. The game doesn’t have lots of depth but is enjoyable in smaller bursts as you take in what the game world has to offer. Explore some impressive game environments. Communicate with others through the Forest Action system. Change the looks of other deer with Forest Magic. Free to play and only on Windows.